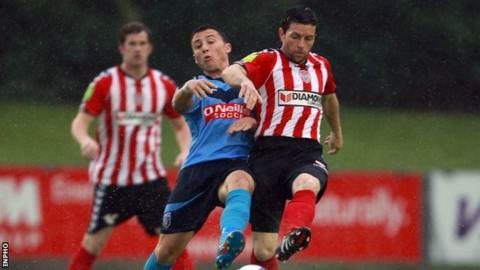 Stephen McLaughlin scored the winner as Derry City secured a much-needed victory over UCD in the Premier Division on Friday night. McLaughlin ran on to a neat flicked pass from Owen Morrison to drive a fine shot past UCD goalkeeper John Kelly in the 32nd minute. Derry had Simon Madden sent-off for a second yellow card in the 84th minute. Fifth-place Derry, beaten 3-0 at home to Drogheda United last week, were on top without creating many chances. In the second half Kelly thwarted McLaughlin after Madden's low cross from the right. City keeper Gerard Doherty saved well from Chris Lyons to deny UCD a late draw. The result will be a boost for injury-hit Derry who face leaders Sligo Rovers at home in their next match on Friday, 13 July. Former Monaghan United striker Conor Murphy, and midfielder Marc Brolly from Dungannon Swifts, will be eligible following their moves to the Brandywell. They signed on Thursday but not in time to be able to feature against UCD.